One of the largest companies in the machine tool industry, CNC New, Inc. has been in business for over twenty years and is currently going stronger than ever. Known for their top of the line manufacturing capabilities and elite machine tool related services, CNC has now created a newly invented line of Gang Tool Industrial Slant Lathes. A welcomed addition to any manufacturing company, there’s no question that the recently developed slant lathes are both dependable and versatile. In fact, these slant lathes are considered to be far above similar types of industry machinery. With a singular, weighty casting, the new slant lathes will provide the best options for all turret and gang lathe specific construction jobs. Currently obtainable in four different GT-ISL models, these new lathes come in a 25mm, 35mm, 45mm and 50mm lever feed dimensions. Not stopping there, CNC New, Inc. plans on releasing additional models in the very near future that include the SL-340/T250 and the SL-340/T280. Providing precise, accurate and compact footprint designs, this new line of lathes will immediately provide a positive impact on each one of your specific jobs. Ensuring that each lathe model has been perfected, CNC has been working closely with top manufacturers like GSK, Fanuc and Fagor. Also helping to establish their top of the line slant lathes, CNC purchases only the top quality ball screws, linear rails and spindles to make sure that each individual lathe is ahead of the class. Now available on a 3-axis system, the new slant lathes have specific controls that have certain capabilities that allow performance indexing and interpolation abilities by using a unified C-axis. Containing a hydraulic cylinder, A2-4 Spindle Nose, a 10hp power rating, 17.32 rail span, SAE metric spindle, a casting weight of 2,600 pounds and a cast iron head stock, each slant lathe is extremely durable when compared to their predecessors. Without question, the newly invented slant lathes are at the top of their class. Adding to the high quality machinery that is part of the slant lathes manufacturing, CNC has also installed industry leading electrical components that are premium grade strengthened CNC controls. With certain range advantages and features, these specifically designed slant lathes are a true industry leader. Giving its users a longer tool life, enhanced accuracy and stronger finishes, the newly developed slant lathes will not leave you disappointed with their performance. When it comes to the CNC controls that are part of the new line GT-ISL slant lathes, no other control system in the industry even comes close to comparison. With top of the line performance systems and standards that have simple digital tuning capabilities, each slant lathe is extremely easily to operate. Quite simply put, if you are in the market for a slant lathe, any of the new GT-ISL models will satisfy your needs. 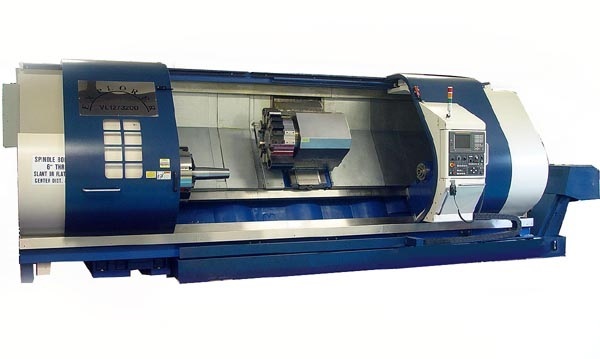 See our wide selection of metalworking lathes here.